Warsaw, Poland - UEFA has launched a new racism investigation against Croatia after their fans displayed offensive banners during a Euro 2012 match. 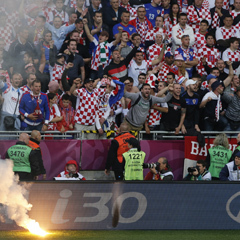 UEFA says it has opened disciplinary proceedings against the Croatian football federation "for the setting-off and throwing of fireworks, and the improper conduct of supporters (display of racist banners and symbols)" during the Group C match against Spain on Monday. The federation was fined €80 000 on Tuesday after fans racially abused Italy forward Mario Balotelli in the team's second group match. UEFA's disciplinary body will deal with the new case on Sunday. Croatia were eliminated from Euro 2012 after finishing third in a group also containing Ireland.